Should we worry about geomagnetic storms caused by solar activity? The Sun’s unexpected and unpredictable activity that takes place on its surface throughout the years tell us we should prepare for the worst. Huge explosions of plasma from the Sun’s corona, known as coronal mass ejections (CMEs), could one day produce extremely powerful geomagnetic storms that could strike Earth with enormous destructive power. When a CME strikes Earth’s atmosphere, it causes temporary disturbances in the planet’s magnetic field, called geomagnetic storms. These storms can affect power grids, blacking out entire cities, impede radio communications and GPS navigation systems. They could even disrupt satellites in orbit. So should we worry that one day an extreme CME would cause a very powerful geomagnetic storm, causing a global catastrophe and endangering lives? “The short answer to this is absolutely. The possibility of an extreme CME causing a very powerful geomagnetic storm is real. There’s considerable uncertainty [about] how frequent such storms are at the level where we worry about huge impacts on the power grid and the resulting impacts that a lack of electricity would have. Is it a 1 in 50, 1 in 100, or 1 in 1,000-year event? We just don’t know,” Doug Biesecker of the National Oceanic and Atmospheric Administration’s (NOAA) Space Weather Prediction Center, told Astrowatch.net. The largest recorded geomagnetic storm in history occurred in 1859 and is called the Carrington Event, or sometimes the “1859 Solar Superstorm”. It disrupted telegraph systems throughout Europe and North America and auroras were seen in points across the globe. Scientists predict that if a Carrington-sized event were to strike today it would be devastating to our society, hitting almost every aspect of our modern lives. With our dependence on electronic devices, internet, and satellite navigation systems, it would wreak havoc on humanity, damaging vital services such as transportation, sanitation, and emergency services. To confront these threats, the U.S. government published its National Space Weather Strategy in October 2015 as well as the National Space Weather Action Plan. These initiatives outlined activities that it was believed would increase the understanding, monitoring, prediction, and mitigation of space weather hazards. “There was a new National Space Weather Strategy published by the White House in October 2015. This and an accompanying Action Plan specify what federal agencies and industry must do in the coming years to be prepared for not only forecasting an extreme event but [also] ensuring the nation is resilient to the impacts of such an extreme event,” Biesecker noted. These documents aimed to enhance the preparedness for space weather events by interweaving and building upon existing policy efforts. They also identified overarching goals that underpin and drive the activities necessary to improve the security and resilience of critical technologies and infrastructures. However, many of these activities will require long-term activities that necessitate sustained engagement among government agencies and the private sector. Hopefully, the current fleet of spacecraft operating in deep space, designed to study the Sun and solar activity events, will remain helpful when it comes to predicting space weather. Biesecker is convinced that spacecraft like NASA’s Solar Dynamics Observatory and the Solar and Heliospheric Observatory (SOHO), built jointly by NASA and the European Space Agency (ESA), revolutionized our understanding of solar activity and improved our space weather prediction models. “SOHO was very much a game changer. In January 1997, the LASCO coronagraphs on SOHO observed what is now commonly referred to as a partial halo CME. Four days later, a geomagnetic storm occurred that was predicted based on the SOHO observations. This ushered in a revolution in forecasting, leading to [a] more concrete knowledge of CMEs, the drivers of geomagnetic activity. Previously, one relied on proxies, such as erupting filaments or long duration solar flares, but these were at best about 70 percent reliable. Not only does a coronagraph tell us for sure that a coronal mass ejection erupted, but it tells us the direction, size, and speed. These have led to dramatic improvement in understanding the propagation of CME’s in the solar wind and in predicting geomagnetic storm occurrence and timing,” Biesecker explained. “SDO is giving us a clearer picture of solar active regions and erupting filaments. The high cadence and high resolution of SDO give forecasters the clearest evidence of how sunspots and active regions are evolving and to then assess their potential to produce solar flares,” he added. 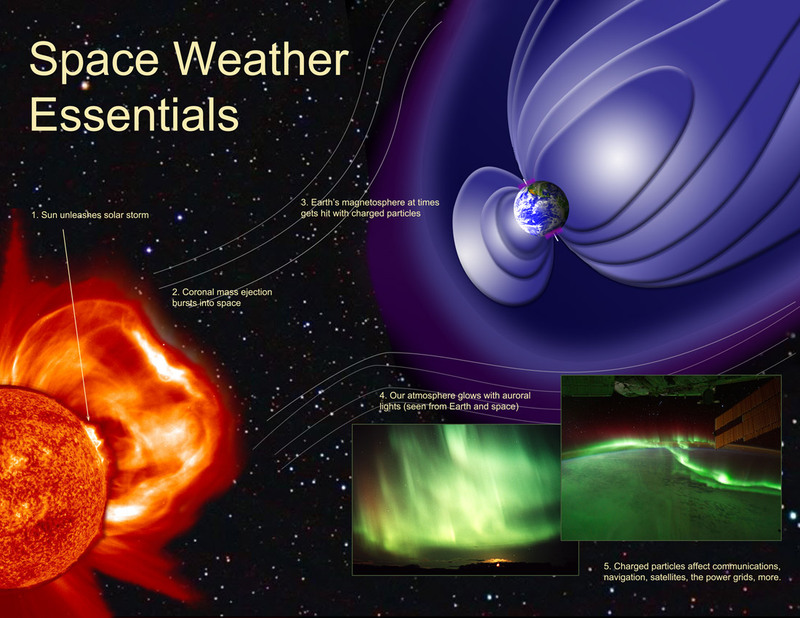 Predicting what influence a CME would have on Earth and how much power geomagnetic storms could create is crucial to make important advancements in forecasting and to prepare for the devastating effects of space weather. Currently, the coronagraph can tell us whether Earth will get hit by an eruption and determine when these events might occur. Launched in February of 2015, NOAA/NASA’s Deep Space Climate Observatory (DSCOVR) could be very helpful, serving as an “early warning” spacecraft. 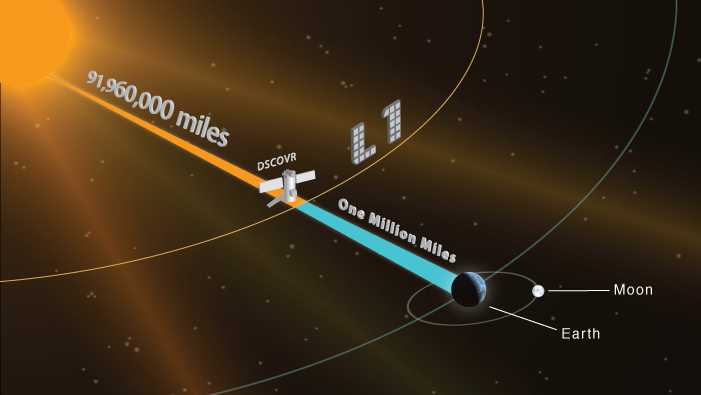 DSCOVR is operating at the Lagrange point 1 (or L1), between Earth and the Sun (approximately one million miles from our planet), observing and providing advanced warning of particles and magnetic fields. Placing DSCOVR in orbit around the L1 point provides definite advantages, including the quality of solar wind observations. The spacecraft can tell us in advance when a surge of particles from the Sun will hit Earth and if they have characteristics that will cause a geomagnetic storm on our planet. “That is why an L1 monitor such as DSCOVR is so important. The key to improving the long lead time forecasts is determining the strength and direction of the magnetic field that will interact with the Earth’s magnetic field as early as possible,” Biesecker said. Biesecker also noted that NOAA was also interested in the Sunjammer mission to fly some basic instruments closer to the Sun with a solar sail (by a factor of two over the L1 distance). The spacecraft was slated to launch along with DSCOVR, but, unfortunately, the project was cancelled in 2014. Sunjammer was expected to provide early warnings of potentially hazardous solar activity. Many future projects are still waiting implementation. There are many groups trying various techniques to determine the magnetic field using, e.g., Faraday Rotation from radio observations, or using the Zeeman or Hanle effects from white light or infrared observations. However, as Biesecker noted, these are still in the earliest stages of development, with many of the efforts just looking for funding. “While solar activity such as solar flares and CME’s roughly correlate with the solar cycle, as we consider more extreme events, this correlation gets weaker. So, while we are headed towards fewer flares and CME’s on average, the likelihood of extreme events is always present. Even in the last solar cycle, the most extreme events in that cycle occurred two to four years after the maximum of the solar cycle,” Biesecker said.